In light of Karl Barth's Christology and views on election, few would argue that Karl Barth shared anything with the Orthodox idea of theosis. Adam Neder states towards the end of Participation in Christ: An Entry into Karl Barth's Church Dogmatic, "If ever there was an enemy of deification, was it not Barth?" (89). The question comes at the end of Neder's work but looms large — what can Barth possibly add to a discussion on deification? Against a looming "nein," Neder's answer is a resounding yes — "Barth shares many of the basic convictions upheld by those who affirm theosis, and he addresses many of the same dogmatic issues which that teaching presents" (91-92). Neder dedicates a part of Participation in Christ for every volume of Barth's massive Church Dogmatic. Covering this content requires massive text selection and summarization by Neder. Against those who might disagree with his approach, Neder suggests "carefully following Barth's argument within a given section—rather than constructing an interpretive thesis and then supporting it with proof texts culled from various places" (xiii). Though some may suggest that Neder himself is guilty of ignoring portions of Barth's Church Dogmatics, the burden of proof has been transferred given Neder's successful demonstration of his cross-volume thesis — Barth does have a distinctly "Barthian" understanding of theosis as established in his doctrine of union with Christ. Not to confuse, Neder clearly states that Barth does not affirm the “deification” present in Orthodox and Lutheran expositions. But neither does Barth disregard their questions and concerns as Reformed theology is inclined to do. Neder summarizes on behalf of Barth that if they are guilty of over-answering, then the Reformed world is guilty of avoiding the question (86-88). Barth remains one of the few ecumenical voices on deification on behalf of the Reformed tradition. 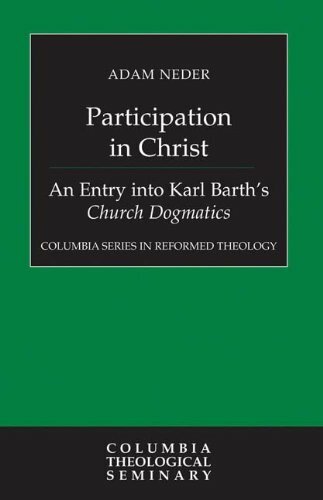 In conclusion, Participation in Christ: An Entry into Karl Barth's Church Dogmatics is a thought-provoking look at Barth's Christological take on salvation, deification, and union with Christ. Barth's voice is succinctly added to the ecumenical discussions of the church — "a valuable thing indeed" (92).